One of the greatest natural protectors against the symptoms of Rosacea is that of the almighty licorice root. Until recently, many of the holistic benefits of this magical herb had been an overlooked remedy for many common skin issues. Today, studies have found a number of highly useful purposes, including as a superior methodology to minimizing the sometimes embarrassing symptoms of Rosacea. Licorice root has been used in ancient medicine for centuries in cultures such as China, India, Greece, Egypt, Turkey, and more. Throughout time, this herb has been used to cure illness and minimize symptoms of various ailments such as to treat coughs and sore throats, subdue asthma attacks, act as a digestive aid, and provide anti-inflammatory assistance. In more recent times, as Scientific Reports published, it is also used to treat ulcers, acid reflux, viral infections, and constipation. It can even help with stress, PMS, and menopause. One of the most fascinating aspects of this Mediterranean herb is that it possesses the ability to make the effects of other herbs more powerful. You will often find it in many products unrelated to the symptoms listed above as it acts as a booster for other remedies, as well. Dr. Oz explains that licorice root plays a significant role as a natural remedy for Rosacea and potentially even as a cure. He explains that the herb assists in greatly reducing inflammation in most cases. Licorice root also has the ability to protect against dangerous UV rays, as well as to assist in flare up reductions caused by dermatitis. Various studies have revealed that people with Rosacea who use a product with licorice root, or a byproduct of the herb, on a daily basis are far more likely to minimize Rosacea signs whether it be from shaving, sun exposure, or any other skin irritant. The results in participants go beyond simply an improved skin appearance; they also help to boost confidence and self-esteem in Rosacea sufferers. It is important to note that as with all natural herbs and medications, too much of a good thing can hinder your intent. Carefully engineered Rosacea products featuring licorice root by reputable companies are well aware of the potential dangers of using licorice root in excess. You should use these products as directed rather than to consume licorice root without the expertise of medical professionals on your own. 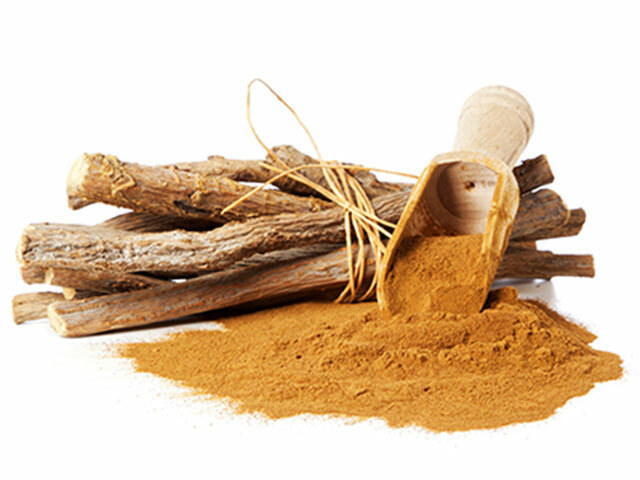 People who digest licorice root in large quantities have been known to get high blood pressure, affect hormone levels in an extreme manner, potentially cause preterm labor, headaches, and heart attacks. To prevent such potential side effects, use reputable products as directed. Studies have proven that licorice root has the ability to minimize the signs of Rosacea in a safe and effective manner when used as directed. This ancient herbal remedy will protect your skin from flare ups and UV rays, as well as improve your self-esteem and confidence. Licorice root is a winner in the fight against Rosacea.